We were able to reduce the number of pivots needed from 86 to 60 while increasing the acreage covered from 5,040 to 5,915 acres. A large, global agribusiness company found themselves owning a remote farm in a state of disrepair due to the owner's default on financial obligations to the Company. After careful internal analysis the Company elected to liquidate and retained Scythe & Spade to manage the entire process. During this time the farm was owned and operated by a large, national food company. This company was responsible for implementing the farm’s irrigation system which included a buried mainline for surface water, two booster pump stations, and 12 ancillary pump stations. The subsequent owner was another large, national food company. In 1996, the farm was acquired by a local independent farmer and operated for almost 15 years. The most recent crops were harvested in 2010. The farmer incurred substantial debt and was forced to declare bankruptcy in 2012. Our client, a creditor, obtained the farmland and plant parcel through the bankruptcy court in October 2012. The Client conducted various internal and external studies on the property. An appraisal concluded a value of $24.5 million for the farm with a separate value of $10-$12 million for the plant. Initial estimates were as high as $8.2 million in capital improvements to the plant and at least $14 million in improvements for the farm. The Client was also incurring approximately $100,000 in monthly expenses with the property producing no revenue. After their internal review, the Client decided to sell the property. Based on our position in the market and knowledge of the industry, we understood the history and complexity of this property. Preliminary Title Report did not include all parcels; search was extended and additional exceptions were found. After a detailed review the exceptions were cleaned-up and minimized. Water Rights originally presented as owned included POU (Place of Use) acres appurtenant to lands outside the farm boundary. Although physical access was evident, there was no legal easement to the northern part of the property. Expired lease with Oregon Department of State Lands affected farmed acres and water rights usage. Certain water rights with Oregon State required additional negotiation. Missing easement for mainline across adverse property. Soils under multiple proposed pivot locations were tested and analyzed by soil specialist. Prior to retaining our services, the Client had commissioned a water study from a nationally-recognized water engineering company. That company estimated a cost of more than $14 million in improvements needed to include 86 new pivots covering 5,040 acres. 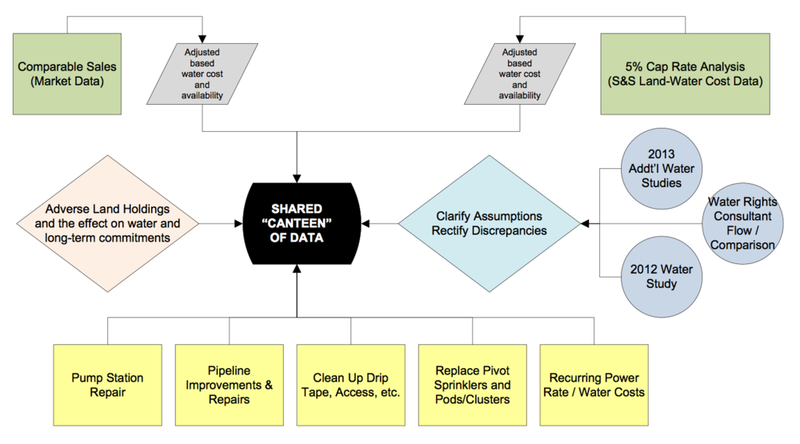 Scythe & Spade conducted additional water studies and collaborated with several regional and local firms to compare and contrast the initial report findings. Subsequent water plans were able to reduce the number of pivots needed from 86 to 60 while increasing the acreage covered from 5,040 to 5,915 acres. Initial offers received were in the range of 50-60% of the asking price. We marketed the listing to our network of buyers and were able to get a substantially higher offer from an experienced investor with a history of improving distressed properties. The final contracted price was 25% higher than the next highest bid. By conducting a detailed due diligence study in advance of publicly offering the property for sale, we were able to identify and resolve numerous issues that otherwise could have derailed a successful transaction.